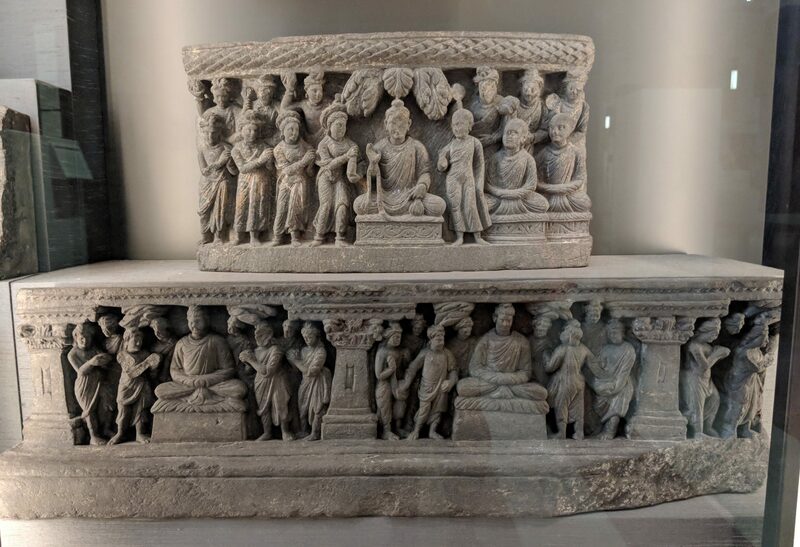 The first object you encounter when approach the Gandhara section of the Hotung Gallery is a large, beautifully carved preaching Buddha sculpture from Jamalgarhi, which you may remember from A History of the World in 100 Objects. 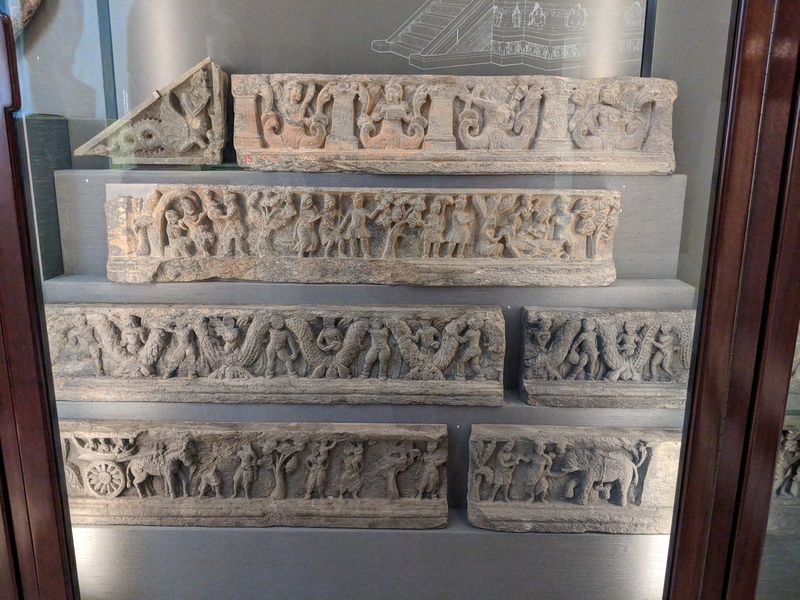 Looking through the museum’s extensive Gandhara collections, it soon became apparent that we had enough material from the stupa at Jamalgarhi to recreate entire sections of it. It also became quickly apparent that there was no way all of these sculptures would fit into the Hotung Gallery’s historic display cases. Excitement merged with reality, and I had to come up with a new plan. My curatorial approach to one half of the Gandhara section was, on the face of it, straight-forward: I wanted to contextualise our collection of Gandhara sculpture architecturally. 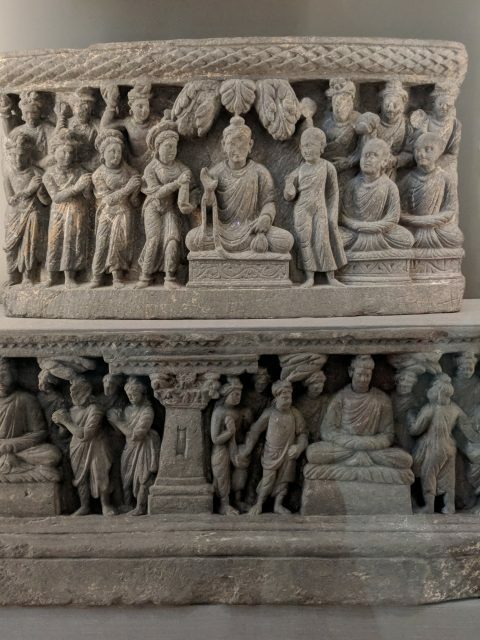 Like many of our visitors, I was used to seeing panels and figures carved from dark grey schist, occasionally interspersed with disembodied stucco heads, displayed as aesthetically pleasing examples of Gandhara sculpture. This is fine; after all, they are aesthetically pleasing. What was missing, for me, was context. Unless you have been immersed in the study of the art and architecture of this region, it is not immediately apparent that the Gandhara sculptures you encounter in a museum are not only related to one another and have a particular decorative, architectural and spiritual function, but they are also linked with specific types of buildings in Gandhara and the surrounding region referred to as Greater Gandhara. Similarly, there is often no indication what the buildings themselves, nor the landscapes in which they were constructed, may have looked like – or what the sites look like today. These were the main points I was keen to address in the new display, with the overall aim of essentially decoding a Gandhara stupa for our visitors. 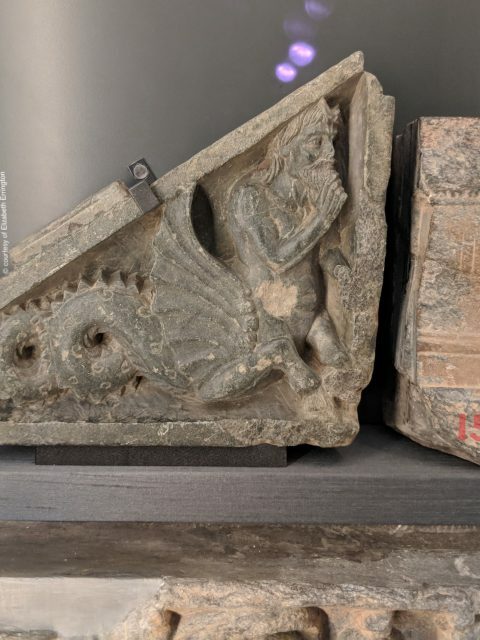 I wanted to use as much sculpture from one site as possible so that there would be some coherence to the display, so I started by looking at the collection from Jamalgarhi, a site northeast of Peshawar, Pakistan. Sculptures from this site are held at various museums, including the Indian Museum (Kolkata), CSMVS (Mumbai), Peshawar Museum and the British Museum. We have around 85 pieces of sculpture from Jamalgarhi, ranging from stair-risers, drum panels, Atlas figures and different types of capitals, to large scale figures of the Buddha and Maitreya, and, unusually, a huge carved disc which was used as a chattra (parasol) support on top of the stupa. The collection from Jamalgarhi is not, however, encyclopaedic. 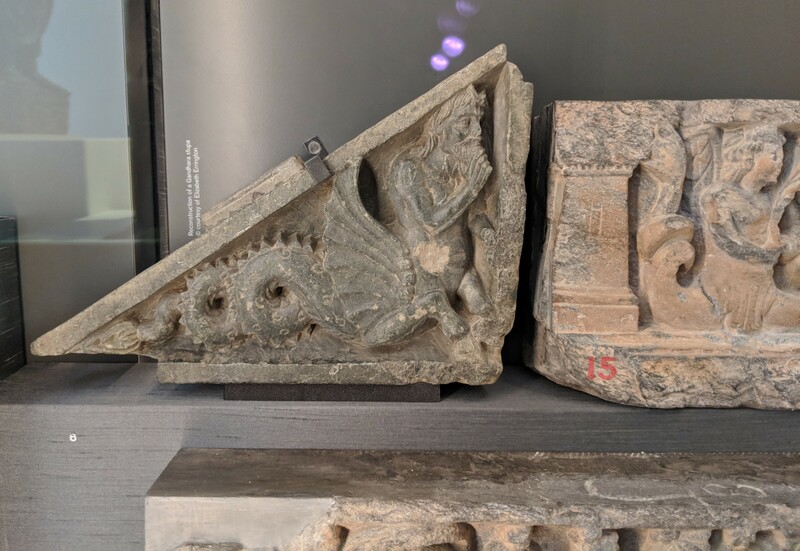 We do not, for example, hold examples of architectural and decorative features found on other Gandhara stupas, such as garland holders, and, notably, no reliquaries were found inside the Jamalgarhi stupa. In addition, while stucco decoration was found at Jamalgarhi, we do not have examples from this site. 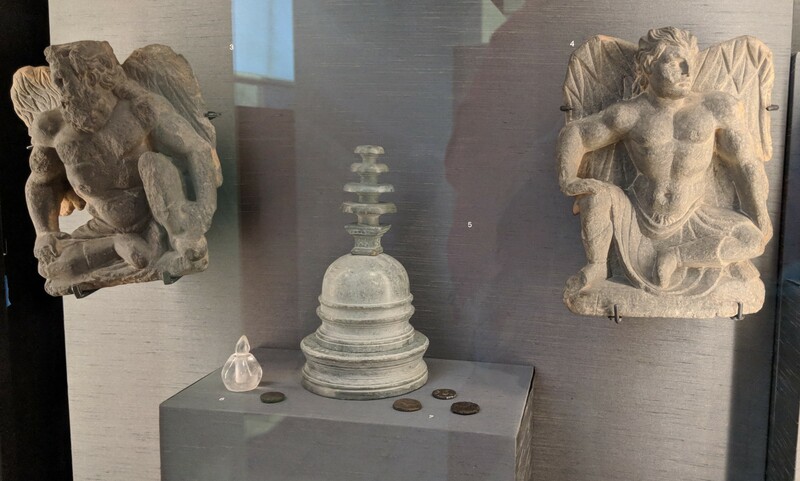 At this point, I had two choices: 1) use only the sculpture we hold from Jamalgarhi in order to create a display focused tightly on this particular stupa; or, 2) bring in components from other Gandhara stupas so that visitors would be able to see a wider range and type of decorative and architectural features. As you can see from the photograph of the display above, I went for option 2. One of the main reasons for this decision was to showcase a variety of features that were likely to be found in the context of a Gandhara stupa and the shrines that surrounded it so that, if visitors encountered these objects elsewhere, they would be able to both contextualise them and understand their function. 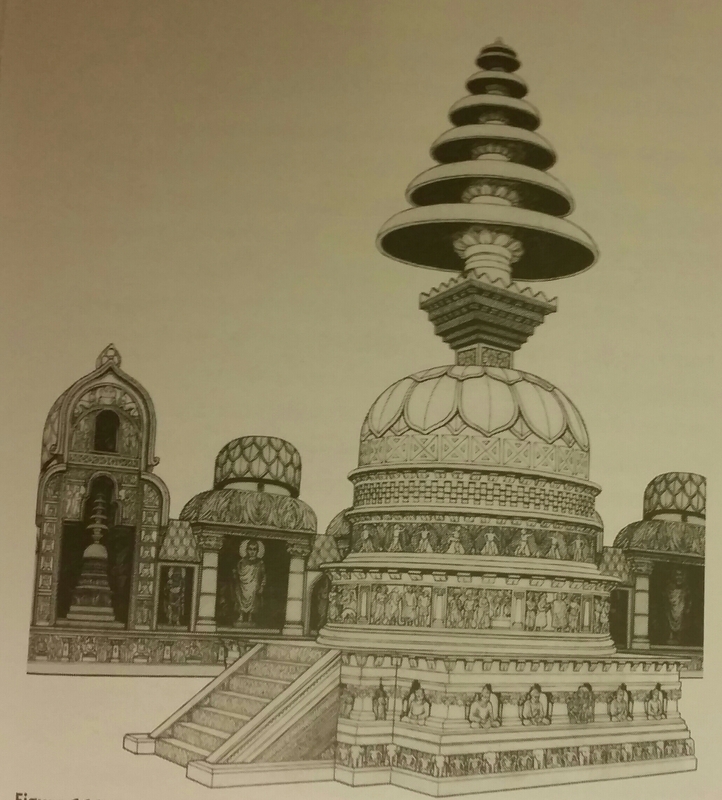 An illustration of a stupa was key to this display because a visitor had to be able to visualise the structure in order to understand how all the different sculptural components fit onto it. I chose a drawing by Elizabeth Errington which was published in Errington and Sarkhosh Curtis (eds.) From Persepolis to the Punjab (2007). 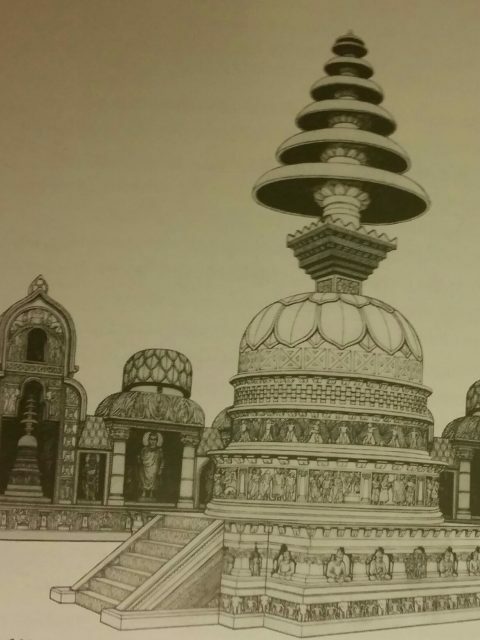 This drawing provides a detailed reconstruction of the stupa at Jamalgarhi and on it you can see many of the sculptures that are displayed to either side of the case, including the chattra, atlants and drum panel. Below this image, I included 6 panels from 4 rows of the stair-risers which originally decorated the stairs leading from the lower stupa courtyards to the main stupa. I displayed them here because I wanted to give our visitors the impression that they were being drawn into the display and lead their eyes up towards the stupa, before the display unfolds to either side. The stepped plinth helps with this aim and looks more effective when seen in person than it does in the photograph of the display. 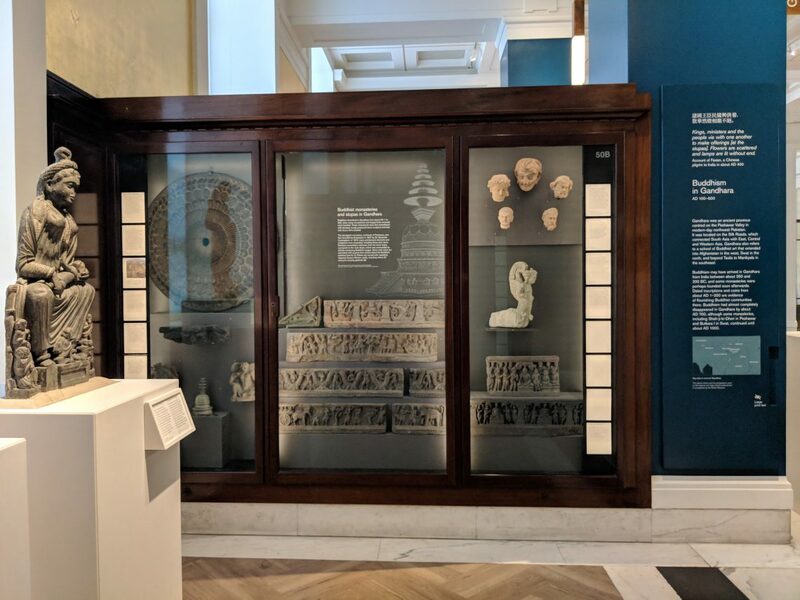 They were also placed here for a practical reason: the central section of the case is the largest, which means that the wide panels can be displayed to best effect here. The display area, however, was not wide enough to show each stair-riser intact, which is why only a few sections were installed here. The surviving stair-risers from Jamalgarhi are not in especially good condition – not helped by the fact that they appear to have been reused in antiquity – which limited my selection. I narrowed the panels down to sections of two Jataka stories alternating with panels displaying Graeco-Roman motifs. If you look closely at the display, you will see a red painted ’15’ on one stair-riser panel and the letter ‘J’ carved on top of some others. During excavations at the site by the Archaeological Survey of India in 1873, many of the sculptures from Jamalgarhi were incised with a ‘J’ to link them with this site. The painted numbers (1-16) on the stair-riers appear to denote the order in which they were originally placed on the individual steps. An important part of my curatorial practice is to keep intact any labels or numbers found on objects because this is a key part of their history. While it is not always possible to share this information in a gallery display through label text, it is something I try to highlight during gallery talks and, of course, blog posts. On the left hand side of the top row, I also included a triangular string panel (1880,1016.2) depicting an ichthyocentaur. 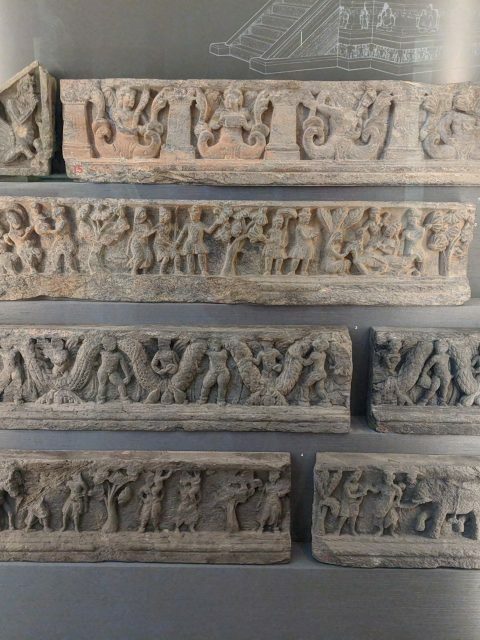 This panel was found in Gandhara, but not at Jamalgarhi. This type of panel may have decorated the sides of steps or ledges with stair-risers running between them. So, the context fits, if not the precise site. All of the objects in this section are from Jamalgarhi, with the exception of the reliquary and its contents which are from the stupa at Sonala Pind. 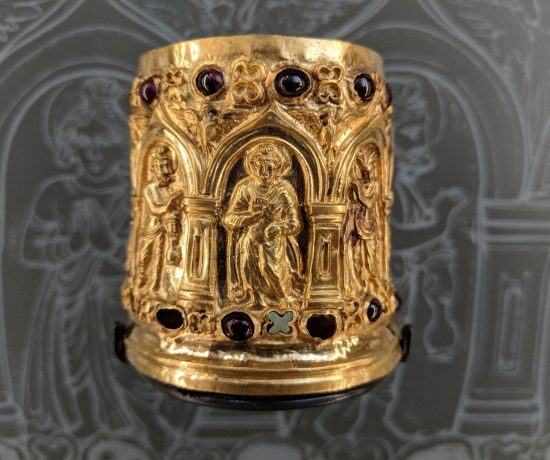 I selected this particular reliquary (1887,0717.34, 35, 35.a, 36, 37, 38, 39) to display here because the shape echoes that of the Jamalgarhi stupa, including the intact chattravali discs, thereby reinforcing the design for the visitors. In the associated label, I emphasised that relics have rarely been found in the Gandhara stupas of the Peshawar valley such as Jamalgarhi. 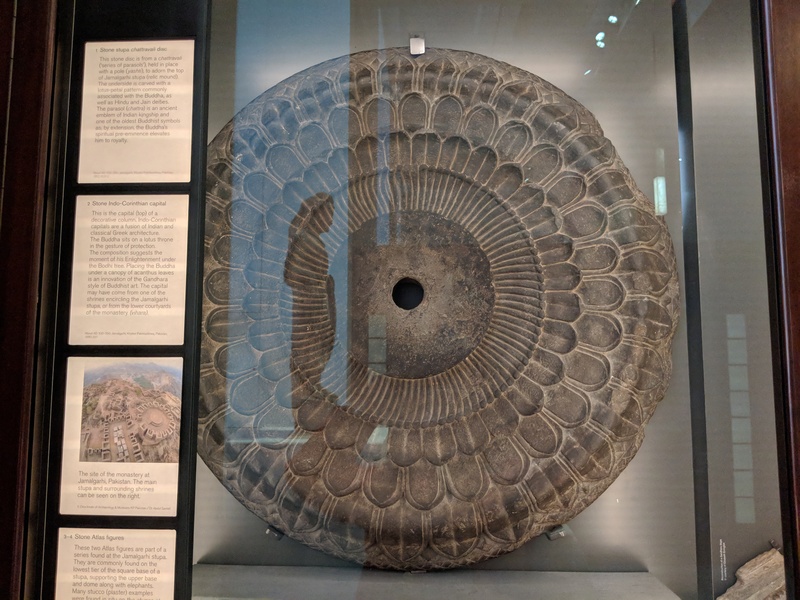 Large-scale architectural components such as stone discs from a chattravali are found in some museum collections outside Pakistan, but they tend to be in fragmentary condition. We are very fortunate to hold a disc (1952,1024.2) from Jamalgarhi which is in almost perfect condition, and this was the perfect opportunity to put it on display. Below it is an Indo-Corinthian stone capital (1880.357) from a decorative column. Although it is not from the stupa itself, I included it because it is probably from one of the shrines which encircled the stupa. It displays an interesting combination of Indian and classical Greek imagery: the Buddha sits on a lotus throne with his hands in abhayamudra (the gesture of protection) but he is placed under a canopy of acanthus leaves, which is an innovation of the Gandhara style of Buddhist art. Two Atlas figures (1880.182; 1880.183) sit below the capital and frame the reliquary. 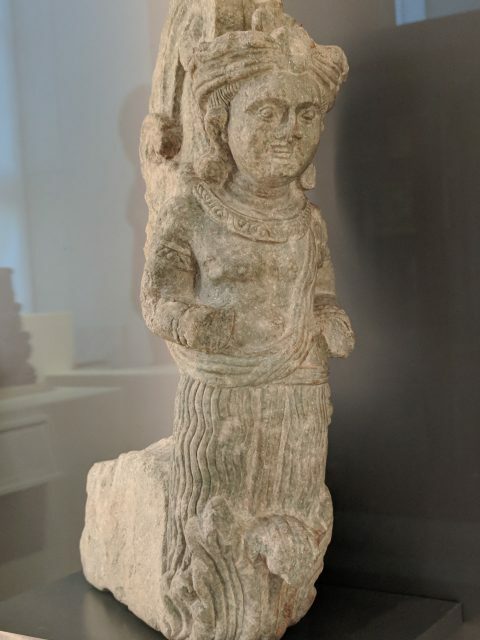 We have some 10 of these figures from Jamalgarhi – the Ashmolean Museum also holds some examples – and I selected my two favourite figures for the display. These figures are usually found on the lowest tier of the square base of a stupa, supporting the upper base and dome along with elephants, as seen on Errington’s image in the central section of the case. 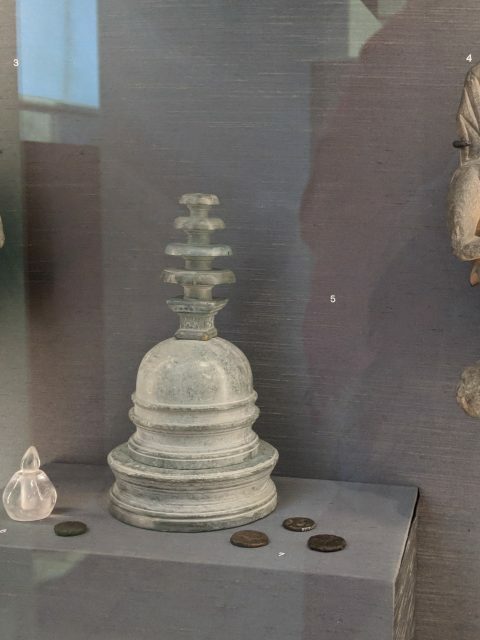 In the overall display of a Gandhara stupa, I wanted to show the different objects in a way that mirrored, as far as possible, their position on the stupa itself. So, the chattravali disc is displayed at the top of the case, while the reliquary rests on a plinth at the bottom. While this sounds straight forward, installation was anything but. 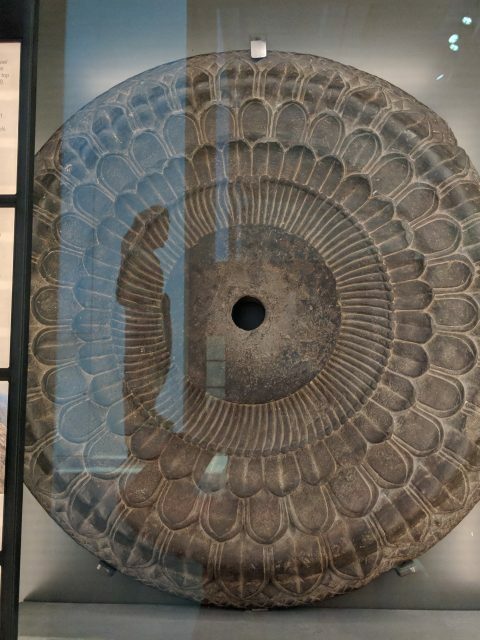 All of the Gandhara stone sculptures are heavy, requiring careful handling and sturdy metal brackets to hold them in place, but the sheer size, weight and shape of the 3 foot wide disc eclipsed them all in terms of the complexity of installation. 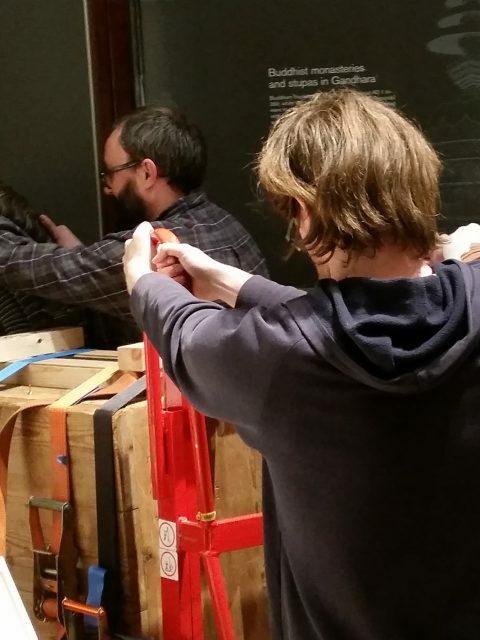 It took some doing, but our Heavy Object Handlers rose heroically to the challenge and it was heaved into place. 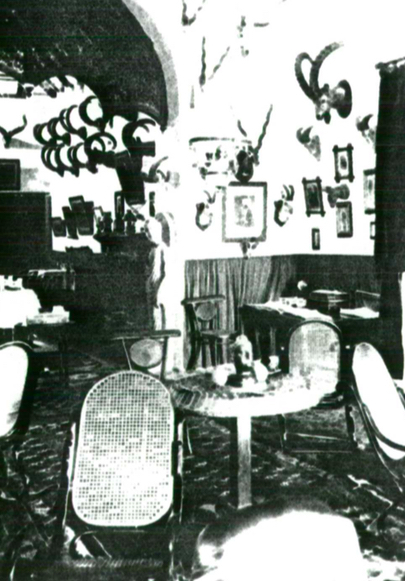 Included in the label panel are two photographs which provide vital context to the overall display. 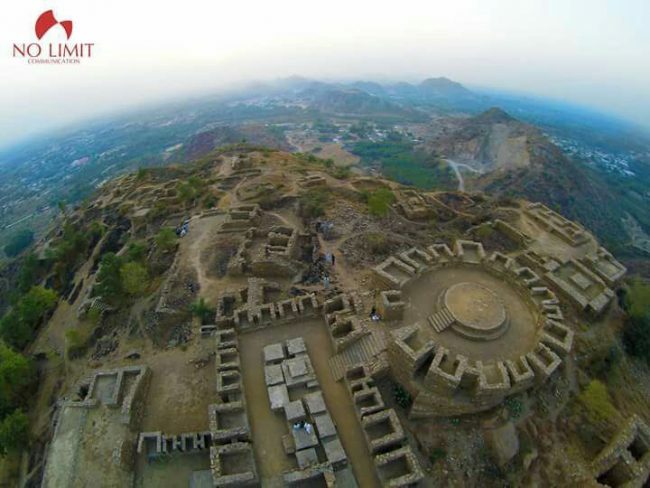 1) is a recent aerial view of the site of the monastery at Jamalgarhi, which shows the main stupa and surrounding shrines that was kindly provided by Dr Abdul Samad, Director of Archaeology and Museums, Khyber Pakhtunkhwa; 2) is an image of Guldara stupa, one of the best preserved stupas in Afghanistan. 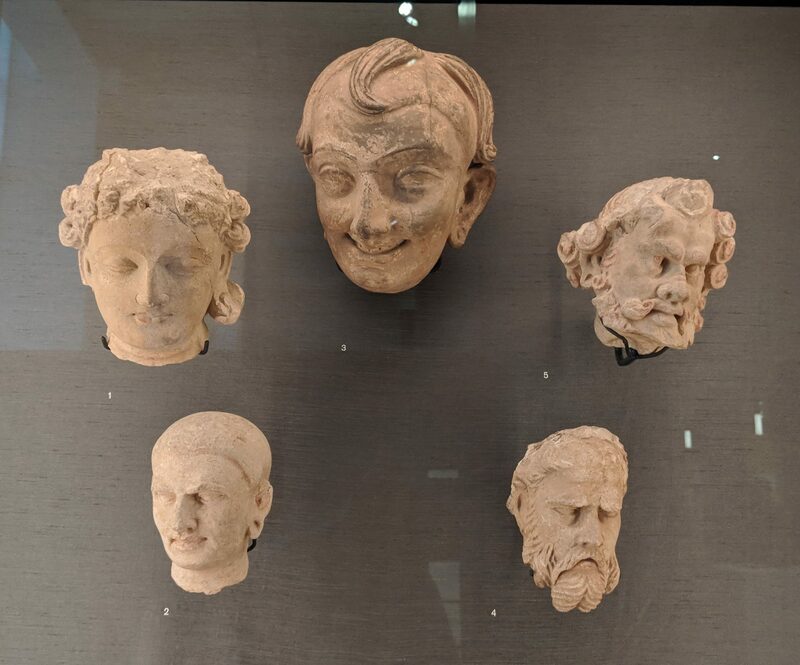 Thousands of stucco and terracotta heads have been found in Gandhara and we have a small collection of them. 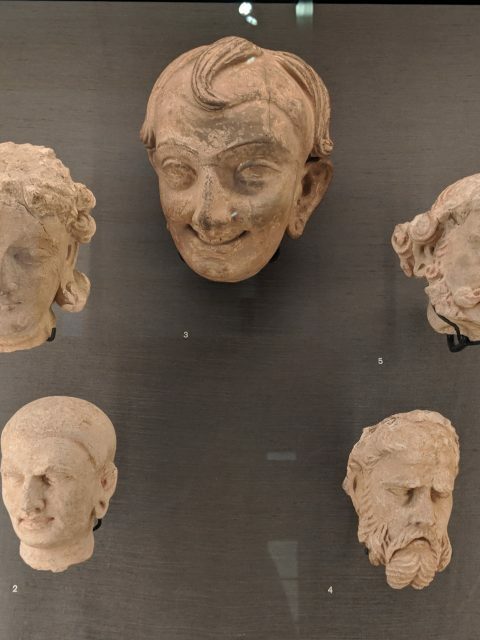 The bodies, which were made from clay and often coated in only a thin layer of stucco, rarely survive, and so you invariably have displays of heads divorced not only from their original context, but also their bodies. For this display, I did think about recreating a small shrine along with a body for one of the stucco heads, but it wasn’t feasible at the time – perhaps in a future display iteration. 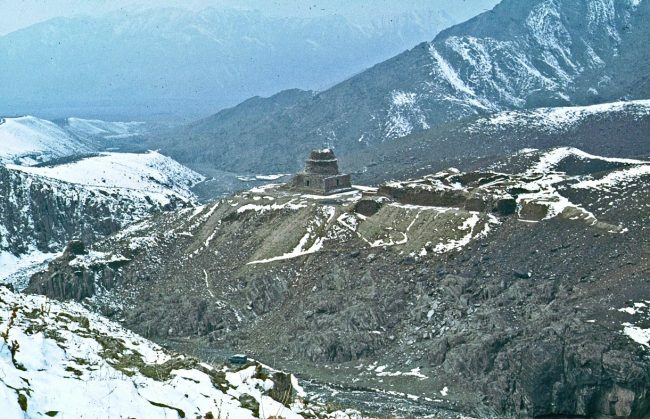 Instead, I selected 5 of the best preserved examples that we have from different sites in Pakistan and Afghanistan, including Hadda and Balkh (1945,0417.21, 1978,0306.1, 1856,0412.1, 1939,1016.2, 1959,1014.1). They have distinctive features so that visitors can see the sheer range of stucco figures that were produced and the extremely high level of artistry involved in their creation. Some of the heads on display also have polychromy residue and this is another aspect of both the stone and stucco sculpture that I would like to emphasise in future displays. Kings, ministers and the people vie with one another to make offerings [at the stupas]. Flowers are scattered and lamps are lit without end. 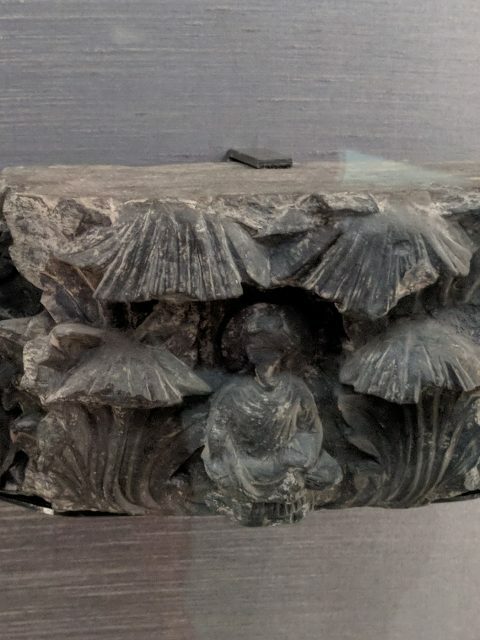 I selected this particular garland holder because it is one of the very few pieces we have from the Dharmarajika stupa at Taxila, a stupa believed to have once contained relics of the Buddha. The acanthus leaves carved on the holder echo the decoration of the Indo-Corinthian capital which is displayed on the other side of the case. The garland holder was initially displayed facing in towards the centre of the case, but I turned it around so that it faced outwards. This position reflects the way it would have been attached to a stupa and encountered by visitors. Drum panels are probably the most commonly encountered and, therefore, the best best known Gandhara sculptures. These panels were often decorated with scenes from the Buddha’s life and this narrative progressed in a clockwise direction around the circular base (‘drum’) of the stupa. The museum holds a number of drum panels from Jamalgarhi and I used some of these in the opposite case which focuses on the life of the Buddha. Here, I chose one from Kafir Kot. 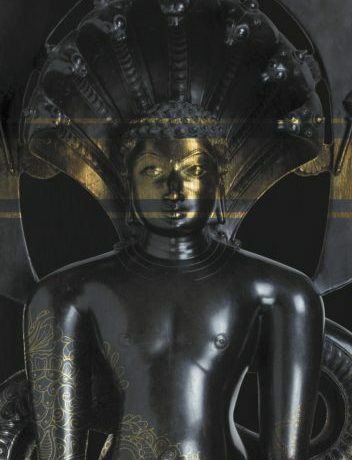 It is in superb condition and the story depicted – Ananda’s intervention which led the Buddha to initiate an order of nuns – fits one of my broader aims for the section of the gallery I curated: namely, to raise the profile of women in antiquity. Immediately below the drum panel, I included a stone corner panel from a square base. Like the capital mentioned above, this panel is from Jamalgarhi, but not from the main stupa. Instead, it may have come from the square base of a small votive stupa or shrine. Many Gandhara stupas, including that at Jamalgarhi, had square bases which supported the circular drum, and this piece provides a useful example of this section of stupa architecture. 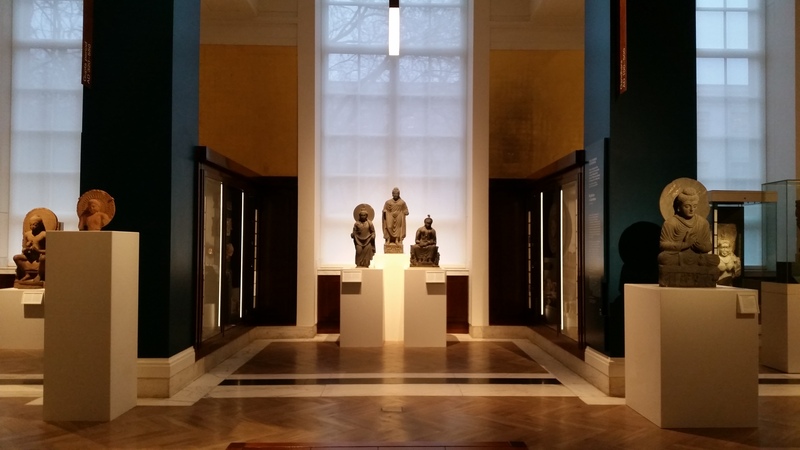 As part of the new approach to the Hotung Gallery, we moved the sculpture which had previously occupied the central length of the gallery so that there would be a long vista directly to the Amaravati sculpture displayed in the climate controlled Asahi Shimbun gallery at the west end of the South Asia section. 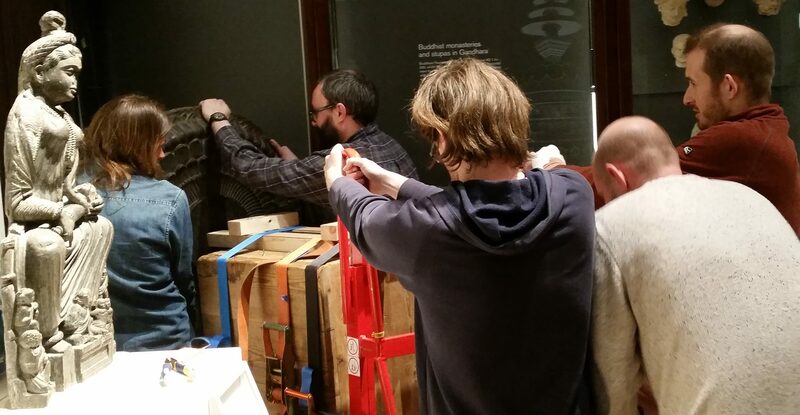 Instead, we placed the large sculptures in front of the columns and windows which run the length of the gallery. 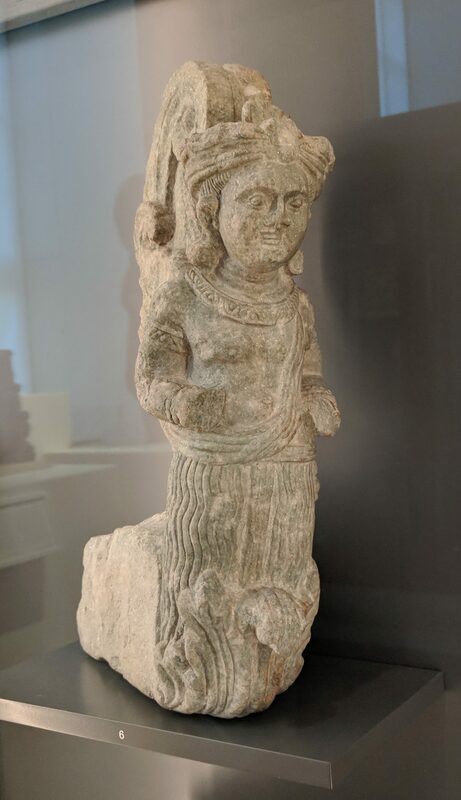 For the Gandhara section, I placed the preaching Buddha (1895,1026.1) at the entrance to the bay because this sculpture was from Jamalgarhi, a site which would feature prominently in the overall display in this section. 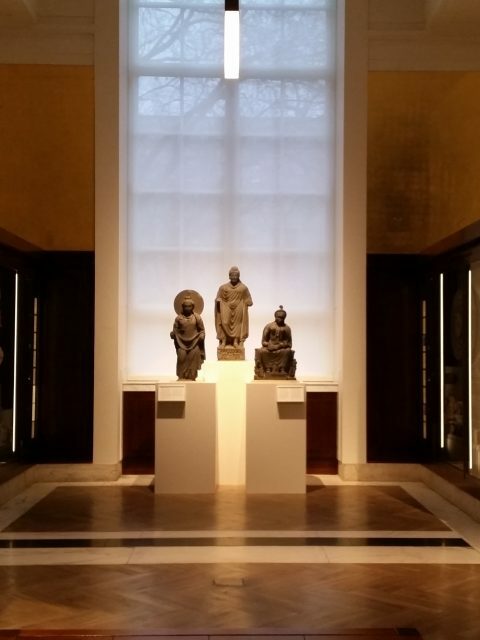 In front of the windows inside the Gandhara bay, I included three large sculptures: Maitreya (Jamalgarhi, 1880.72), Buddha (1947,0511.1) and Hariti (1886,0611.1). It was an opportunity to show the variety of sculptures of bodhisattvas and Buddhist deities which may have occupied niches around a stupa courtyard and which worshippers would have encountered during their visit to the sacred site. Many galleries, including Hotung, are described as ‘permanent’. This means that the overall gallery will stay mostly the same for the coming years. For example, the South Asia section is organised chronologically. However, sections within this broad organisation do change. When I revisit this section in the future, I’m keen to also use it as a vehicle to explain how the sculpture came to the British Museum. It is a complex story involving many people and institutions in South Asia and Europe that unfolded over a number of years. For now, only a small part of the story is mentioned in the Gateway text: the European discovery of the site by Sir Alexander Cunningham in 1847 – although if you look closely at the labels you will see a little more of the overall story. 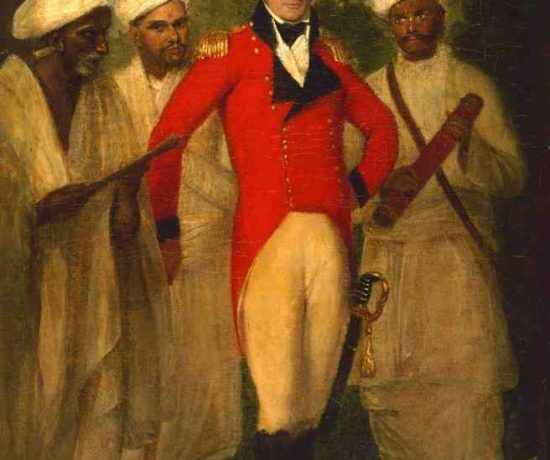 For example, the disc from the chattravali was given to the museum by the British officers of Queen Victoria’s Own Corps of Guides to mark the end of British rule in India. E. Errington found a photograph dated 1897 showing this disc being used a table-top, and I would like to include this as part of a future display.